After 74 years of absence the first Jewish service in Odenbach synagogue. Dear guests from the Jewish Community of Kaiserslautern and Ramstein. I would like to thank you for the service in the synagogue of Odenbach. Gratitude to Rabbi Davidsson who had the intuition filling empty former synagogues with Jewish life. He had invited his congregation to the fulfillment of the Minijan. As well thanks to Bernhard Gerlach who had assimilated this thought and put into action. 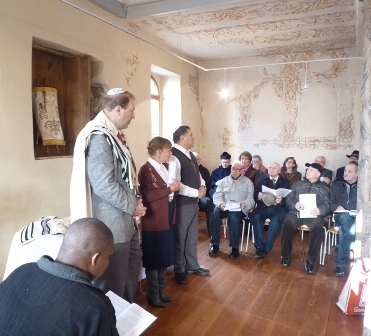 This special event was a historic event in the little synagogue of Odenbach: After 74 years of absence for the first time a Tora roll had been in the Tora shrine again. Jews and Christians, two religions, two sisters, the elder one and the younger one, come together: Let us open our hearts and minds to meet one another.